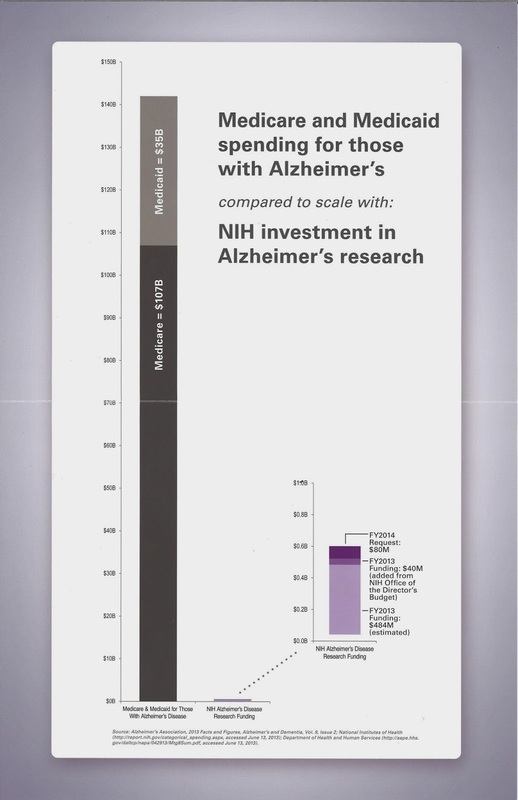 Last week the Alzheimer's Association released the 2014 Alzheimer's Association Facts & Figures. The first F&F was released the year I joined the Alzheimer's Association in 2007. We realized there was no compilation of data - actually no one was actually really looking at Alzheimer's statistics as a whole - especially not law makers. Through Facts & Figures we have not only had data, we have also been able to drive data collection, which is so important when trying to understand the impact a single disease has on an entire nation. Even as a novice advocate I learned quickly the first question will always be, "What is this going to cost me?" I am naive sometimes, always have my rose color glasses on - but in our dog eat dog world I've had to come to the realization that sometimes it is truly all about the Benjamins. Answering back with, you would be saving millions of lives by increasing research funding, by passing the HOPE Act you would make the process of diagnosis, care, hospitalization for millions of families 1,000 times easier. As we prepare for the 2014 advocacy forum in just two short weeks, I am beefing up my money talking points. For example: 1 in 5 Medicare dollars are spent on Alzheimer's and dementia care; $220 billion is the value of unpaid care provided by friends, family & neighbors; As a country, Alzheimer's disease costs us $214 billion - including $150 in Medicare/Medicaid costs. Don't worry, for those of you unable to make the trip to D.C. we will have a virtual visit set up so you can tell your Congressperson not to ignore Alzheimer's disease and dementia. Dancing Through Time was AHAMAZING! You should have been there - actually we were pretty much at standing room only!! HUGE thank you to our generous sponsors, dancers, committee, volunteers and everyone who attended!!! Can't wait for next year, want to join the committee? Email Kim, kmatras@alz.org. Investigating the Research: The Newest in Alzheimer's Studies is a free, open to the public workshop THIS Friday, being hosted in Morgantown and Charleston. Visit the community calendar for more information. Calling all Marketing Gurus! We are looking for a Marketing Chair for our Charleston & Wheeling Walk to End Alzheimer's!! For more info email Kaarmin, kford@alz.org. Caregiver University! Register Now!! Our best year yet, we have a full day of fun (yes, I said fun! ), learning and interacting!! Click here to find an event near you! This past week a great friend of mine had a beautiful baby! I was out of town over the weekend, so I knew the moment I got back I wanted to whip up a ready-made meal for her and her husband. On Monday, W had a really tough day so I knew we needed some comfort food to cure our case of the Mondays. One of the questions we are asked frequently at speaking engagement is, my neighbor is caring for her mother and I want to help but don't want to be too intrusive. Preparing a ready-made meal is one way you can always help a family in a caregiving situation. Roast chicken - literally any cut, or if you have one of those handy rotisserie chickens, even better! I happened to have breast halves in my freezer. Sprinkle with olive oil, salt & pepper. Roast at 350 until temperature reads 180. In a dutch oven or large pot, over medium heat melt 3-4 tbs. of butter (or 1 tbs. of butter and 2-3 tbs. of olive oil). When the onions turn translucent, sprinkle 1/4 cup of flower (or more if you have more vegetables - they should all be coated) Add in 2 tsp. of thyme and rosemary, ample salt and 1 tbs. of pepper. Bring the mixture to a boil. 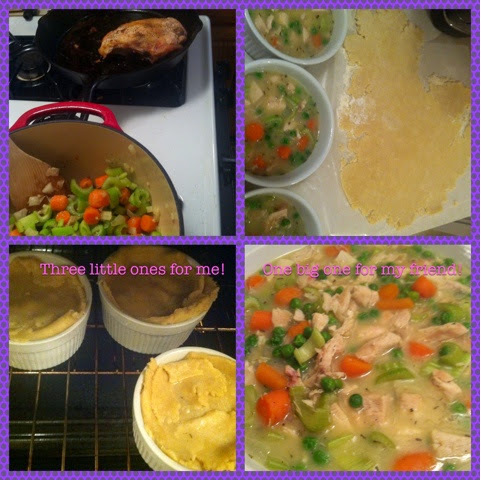 Then it is your discretion - if you like a runny sauce in your pot pie, turn of the stove. If you like it a little thicker, keep it simmering for a few more minutes. Remember, the sauce will thicken in the oven. Remove the chicken from the oven, shred then add to vegetable mixture. PAUSE -> if you would like to make your crust by hand, I highly recommend this one from Martha Stewart. Sometimes hand made crust doesn't travel well when you are delivering - so store bought pie crust or even better a roll of crescent rolls is just as delish on top! Fill a pie pan or individual ramekins about 3/4 way to the top. Don't bake the dish you are delivering (or put the top on) go ahead and pop that one in the freezer, so it can be used when your neighbor sees fit! For your dinner pot pie - top it with an amazing crust (be generous with the crust) and pop it in the oven for 30 minutes at 375 or until crust is slightly browned. WARNING - it is really hot, and smells amazing, don't try to eat until cooled slightly. Sincerely, my scorched tongue.